Gov. 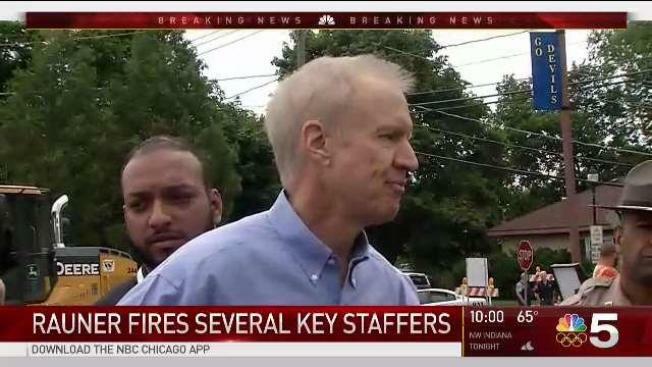 Bruce Rauner fired several key staffers Wednesday night who were hired only six weeks ago, multiple sources tell NBC 5. Editor's note: Earlier reports that Kristina Rasmussen was let go were not accurate. She remains on the job today. The shakeup comes after a lingering controversy over a political cartoon from the Illinois Policy Institute, the right wing think tank Rauner has turned to in his staffer overhaul. Sources confirmed Diana Rickert, Laurel Patrick and Britany Carl, who once compared abortion to Nazi eugenics in a controversial blog post, were all out. Rickert and Carl were fired, sources said, while Patrick resigned. It's believed Rickert wrote the vexing "white male" press release from Tuesday and Patrick sent it out. Several staffers came to the governor's office from the Illinois Policy Institute. Rauner had been out of town for several days this week, taking his daughter to college, and the staff released a press release on the cartoon many lawmakers labeled racist. Among the comments from the Rauner team was "as a white male" he would no longer comment on the controversy. Rauner later released another statement saying the previous one "did not accurately reflect my views." Some speculate that perhaps some of the former Illinois Policy Institute staffers left on their own, upset that Rauner plans to sign an Immigration bill on Monday that conservatives oppose.